The first day of this years Notting Hill Carnival seemed to draw slightly fewer people than in recent years and had a more visible police presence. But everyone was enjoying carnival and there was little trouble. Some carnival organisations have seen cuts in grants from hard-pressed local councils, and this was perhaps the reason that carnival seemed to be on a slightly smaller scale and there were rather less elaborate costumes than before. But Sunday is always a day for children and families and the Mas bands save their major efforts for Monday, the main carnival day. There was a stronger police presence before, and it was made very much more obvious, in particular with large groups of officers dressed in loose-fitting black uniforms and wearing bright yellow baseball caps, giving them a much more menacing look than normal police uniforms. As I went down Ladbroke Grove, groups of this officers were stopping and searching black youths, using their powers under a section 60 order. Brought in to deal with football hooligans in the 1994 Criminal Justice & Public Order Act when this order has been issued for a particular event it gives police the power to stop anyone for long enough to make a search for weapons and dangerous instruments. 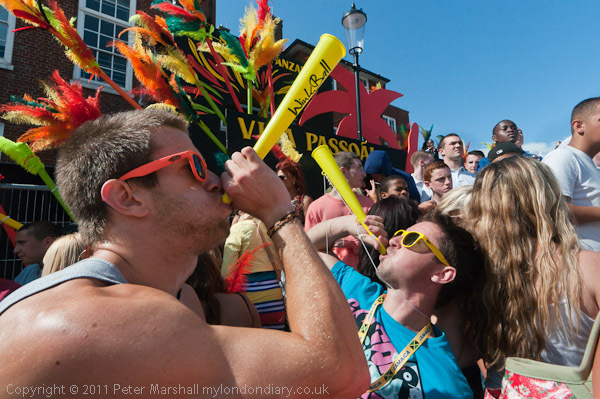 This appeared to be how it was being conducted on the street at carnival, unlike at some demonstrations where police have exceeded their powers by asking for names and addresses and photographing those people stopped. Most people I saw stopped nade few complaints and were on their way again after a brief search, though I did hear objections by some people who felt that only young black males were being searched. Certainly most or all of those searched while I was watching fell in this category. I saw two young black men being rushed away by police through the procession and away past a line of police horses down a road closed to the public, presumably being arrested. But police reported only around thirty arrests, not a great many for a population of this size on an afternoon. Apart from twenty minutes or so of a heavy shower it was a fine afternoon, and everyone seemed to be having a good time, with the usual mixture of Caribbean and other foods, plenty of alcohol and a great deal of dancing, both at the sound systems (some of which were truly deafening, making one's whole body throb with the sound) and with the floats which later in the afternoon had gathered large crowds of dancers going along the road behind them. There are two sets of pictures here, each roughly in the order in which they were taken, starting with two and a half pages of images on the Fuju Finepix X100, followed by images taken with the Nikon D300. 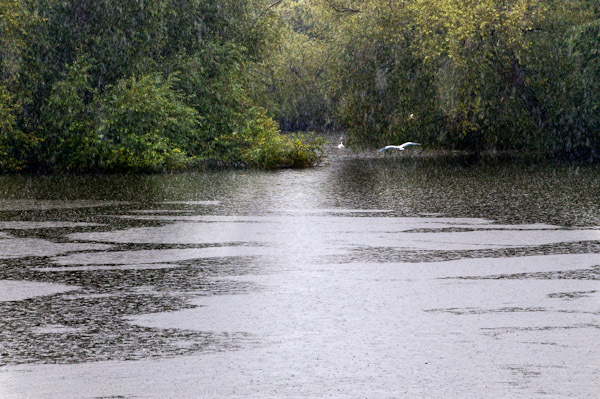 The question most people reading this may well be asking is 'Where the **** is Eynsham?' and fortunately the answer is 'Not very far from Oxford' and one of its main attractions is the good bus service taking you back there. However had you been reading this web site a thousand or so years ago (tricky because I don't think those Anglosaxons were too hot on internet protocols and although the avian-based RFC1149 would have been technically feasible it was only published in 1990, more or less as Tim Berners-Lee was inventing the web) the question you might have been asking was 'Where the **** is Oxford', a rather less significant place until it got the idea of a having a university. As we found when we got there, Eynsham had a huge abbey, though the only real sign we saw remaining of it were its fish ponds. But that was at the end of our walk, shortly before I mutinied and made for the Red Lion. We started at the station and made our way to the Thames, where our Thames Path book seemed to show the path on the wrong side of the river. Years ago, before we had a Thames path, I remember getting quite excited about the draft proposal for it, and even making a few suggestions. Of course there was a tow path next to the river except where some less scrupulous riparian owners had stolen and enclosed parts of it, but it did have an unfortunate habit of jumping from one side to the other at remote places where until around the 1930s there had been a ferry. Now I'm not so sure that such 'long-distance paths' are such a good idea. They encourage people to approach walking in a very competitive and one-dimensional way, 'bagging' stages of the route iin what are more route marches than enjoyable. My kind of walk tends to go a quite a slow pace overall, stopping to look at and photograph things that take my interest, diverting from the path to look at what seem interesting features on the map, not worrying about getting any particular distance. But of course outside the city there are certain practicalities about finding a bus stop or station from where you can get home. My companions are usually rather more heading for the goal, and you will see the backs of two figures in the middle distance in some of my pictures, though not me running after them to catch up. But at least this was a fairly short walk, and we did have time to look around Eynsham, a large village with around five pubs and a post office, as well as a heritage trail around the extensive former abbey grounds which we did around half of. The others were also keen to look for traces of the former railway, an extremely thirst-making and largely fruitless task, serving largely as a reminder of how short-sighted we were in abandoning way-leaves on what might by now have seemed a very suitable route for lightweight community transport. 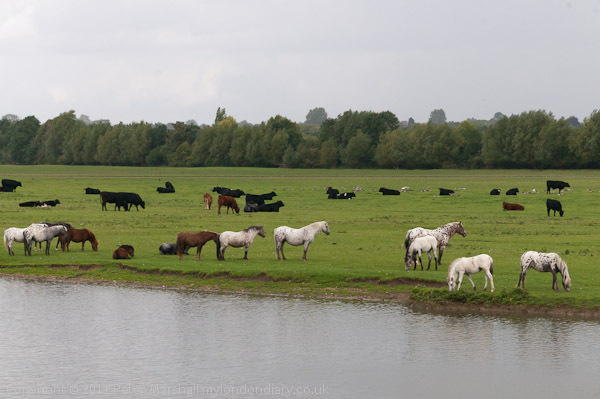 The fiinal picture on my way home was taken from the top of the bus as it went over Swinford Bridge, with a view along the Thames to Eynsham Lock. The bridge is a local traffic bottleneck, with long queues at the rush hour holding up traffic for around 20 minutes or more as motorists have to stop to pay the toll. Although the toll for cars is only 5p that nets around £175,000 a year and, under the Act of Parliament granted in 1767 the income from it is free of income tax - which had not then been invented. A long campaign (at least since 1905) by users continues to get the toll abolished, most recently with a petition to their local MP, a Mr David Cameron, who you think might be able to do something about it. But the owner of the bridge, who bought it in 2009 remains anonymous, and could well be a considerable donor to Conservative party funds. The weather forecast was pretty terrible, and the day more or less lived up to its promise. So together with my son and wife I walked from Abingdon to Oxford along the Thames Path. Fortunately I'd had the sense to put my waterproof trouses on. The sun did come out around 4pm, and it evaporated the water in my lens, which then condensed as a mist all over the interior glass surfaces, finally drying out around half an hour later. We caught the train to Oxford, from where there is a good bus service to Abingdon. It would have been quite a nice walk in decent weather, not too long. Cleaners employed by Ocean Contract Cleaning at City of London Guildhall protested there demanding an end to bullying, threats and racism at work, as well as for recognition for their union, the IWW. Roughly 20 cleaners and their supporters demonstrated at the Guildhall in Gresham St this afternoon. Police came and asked them to move away from the pavement by the side of the Guildhall library where they said the protest would be illegal under Section 14 of the "Police and Criminal Justice Act" as the protesters had not given six days notice of the protest. No notice is normally needed for a static protest like this except for one in the areas around Parliament specified by the Serious Organised Crime and Police Act 2005 (SOCPA.) Section 14 of the "Police and Criminal Justice Act" is actually about alcohol-related disorder and not protest. The relevant act would appear to be the Public Order Act 1986, where Section 14 which only gives police powers to regulate some aspects of a protest in very specific circumstances, "to prevent serious public disorder, serious criminal damage or serious disruption to the life of the community", none of which seemed at risk on this occasion. Although the police appear to have been talking legal nonsense they actually seemed keen to facilitate the protest, and suggested two rather better nearby locations, either Guildhall Yard itself (where normally protests are not allowed, and any event needs the permission of the relevant City of London authority), or the more public paved corner between Gresham St and Aldermanbury. Sensibly the cleaners chose to move to this location to continue their protest. The protesters had two large banners, one with the International Workers of the World (IWW) loga and the message 'Cleaning Injustice' and the Restaurant, Hotel, and Building Service Workers union number, IU 640, and the other with the Cleaners Union of the IWW logo and the text in four languages, "Workers of the World Unite." There were no placards or leaflets, but there were four large paper hats with the messages "No Racism" and "Stop Bullying". Many of the cleaners are from South America, and the chanting, largely about wanting justice and union recognition, was in Spanish as well as English. Several present had IWW t-shirts and the cleaners have moved from being in the mainstream UK unions to this international organisation. Previous demonstrations by the cleaners have been very effective in raising their rates from the national minimum wage to the higher London Living Wage, which attempts to set a minimum required to live in London. This protest was not about wages but about the treatment of the workers at work, calling for a proper respect and for justice, and also for the recognition of their union. The cleaners allege that they have been unfairly treated by the contractor who employs them to clean in the City of London offices, Ocean Contract Cleaning. In a statement they claimed that they "have raised complaint after complaint about bullying, management nepotism and abuse. Our union has been reasonable, professional and constructive." Ocean have so far refused recognition to the IWW branch and although they have said they will deal with the problems, have taken no action, claiming still to be investigating the alleged incidents, which include the locking up of workers for several hours, threats of violence, sacking of those who join the union, passing over of black workers for promotion, giving workers jobs to family members and more. The protesters suggested that Ocean was hoping to evade its responsibilities to the cleaners by the transfer of the contract to another company in September. The cleaners say they want justice now. At one point a police officer returned to complain about the use of the siren sound on the large megaphone used by the protesters when they were not speaking. The officer concerned said that this could cause confusion and possibly prevent drivers from giving way to actual emergency vehicles sounding their sirens on the highway. The protesters continued but with less use of this highly annoying sound. As I left them after around an hour of the protest and walked away I could still hear the sound of their chanting until around a quarter of a mile away. 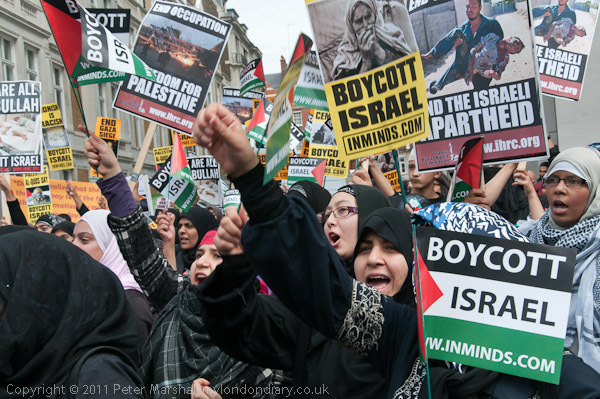 Several thousand marched through London calling for freedom for Palestine in the annual Al Quds (Jerusalem) Day march. 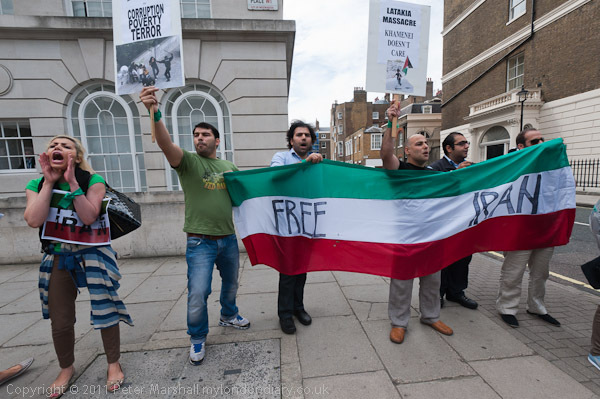 There were small counter-demonstrations by an Iranian opposition group and the EDL. Al-Quds is the Arabic name for Jerusalem and Al Quds Day was started by the late Imam Khomeini of Iran as an expression of solidarity with the Palestinian people and of opposition to the Israeli control of Jerusalem, as well as more widely "a day for the oppressed to rise and stand up against the arrogant." It is on the last Friday of Ramadan which this year is 26 Aug, but the march in London took place on the Sunday before this. Most of those taking part were Muslim and were observing the Ramadan fast. The march is organised by the Islamic Human Rights Commission, an organisation that receives funding from the Iranian government. Despite this and the appalling human rights record of the Iranian Government the IHRC does carry out much worthwhile research and campaigning, including whole-hearted support of the Palestinian cause. The proclamation of Al Quds day and its annual celebration have helped to revitalise worldwide interest in freedom for Palestine, and the even is supported by a number of mainstream UK campaigning organisations including the Stop the War Coalition and Ireland and Scottish Palestine Solidarity Campaigns, as well as major Muslim groups including the Muslim Association of Britain and Muslim Council of Britain. Also backing it, and present on the march were several Jewish groups including Jews Against Zionism, Jews for Boycotting Israeli Goods and Neturei Karta UK as well as other groups supporting Palestine. The marchers, many of whom had come in coaches from around the country, gathered on Portland Place from a little before 2pm, and many said prayers on the pavement before the march formed up. Shortly after this, a small group of protesters against the Iranian regime began a protest against them immediately opposite on the other side of the road. As I walked across the road towards them a police officer stopped me and gave me a warning that some of them or their families might face prosecution if their photographs appeared in the press, and because of this I might not be welcome. I thanked him for the advice and continued across and it was clear that the protesters actually welcomed the attention of myself and the other press photographers present. The two groups remained in position, chanting slogans at each other for the next hour or so, while the very much larger group on the Al Quds march waited for marchers whose coaches had been held up in traffic. Although many of the marchers carried placards with the message 'We are all Hizbullah' and there were chants of this along with 'We are all Palestinians', and their were graphic images of victims of Israeli attacks on Palestinians, the main emphasis was on the need to boycott Israel and companies that support Israel, among those mentioned being Marks and Spencer, Starbucks and Coca-Cola. A huge cheer went up when the Neturei Karta ultra-orthodox Jews arrived, having walked from Stamford Hill. They carried placards which repeated their opposition to Zionism and support for the Palestinians, and when the march started they were more or less at the front, accompanied by several Muslim clerics. The marchers made clear that they were not anti-Jewish and welcomed the support of these and other Jewish groups present opposed to Zionism and the illegal actions of the Israeli forces. It was an impressive march, with almost all of those taking part carrying banners, placards or small Palestinian flags. There were also several very large Palestinian flags, including a very long one carried horizontally. The route went down Regent Street and through Piccadilly Circus to Haymarket and then on to Trafalgar Square. Several EDL supporters watched it as it came to the bottom of Haymarket and police questioned two of them briefly. As the march turned into the top of Trafalgar Square four more came to see it and I saw police briefly question two women, one of whom had stood raising a finger to the front of it. Apparently two others were also questioned briefly. The police had provided a small pen for the EDL on the south side of Pall Mall at the mouth of Spring Gardens, where they were almost invisible to the marchers who were turning into Trafalgar Square. It seemed to them - and I could only agree - to have been an unacceptably distant location. A few of the EDL were standing closer, quietly watching the march and one was taking photographs. The police appeared not to recognise them. Later a number of them walked into Trafalgar Square and walked quietly around, but other photographers reported a small incident where one man who police had previously asked to leave the area returned and was apparently arrested. A few minutes later a small group of EDL appeared with an EDL flag on the North Terrace balcony. They were soon surrounded by police who escorted them back down to the pen amid their complaints that British people should be allowed to demonstrate on the British soil of Trafalgar Square and show their English flag there. 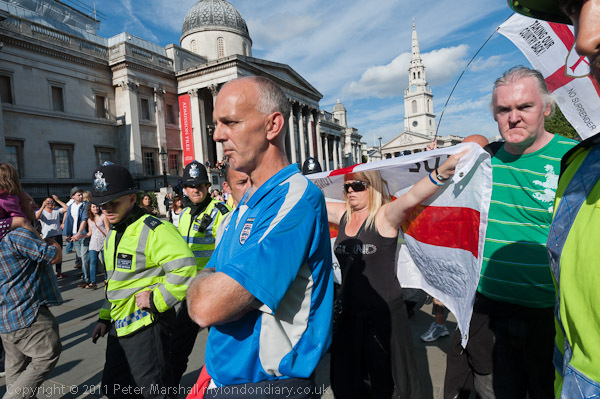 In all there seemed to be around twenty EDL supporters present. Short speeches from several of those present stated that they were opposed to the Al Quds march because it supported Hizbullah, an illegal terrorist organisation, and restated their position that they were non-racist and not opposed to Muslims in general only to Muslim extremists. They insist that they are standing up for England and our English freedoms and have no problems with other people living here as long as they respect our way of life. There were a few moments when individuals started some of the chants which others object to, including 'Muslim bombers off our streets', but while I was there others present quickly told them to "shut it." The group continued to protest noisily but were too far away to be heard by the several thousand at the rally in Trafalgar Square. 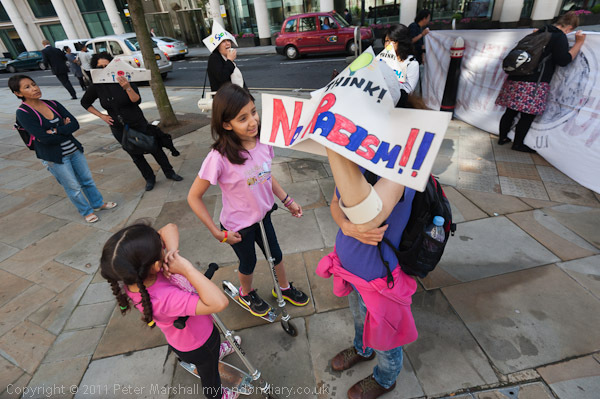 Protesters came to Westminster Magistrates Court to show solidarity with the remaining Fortnum & Mason protesters who were there to enter pleas today. Some went in to sit in the pubilc gallery, while others remaineed outside. 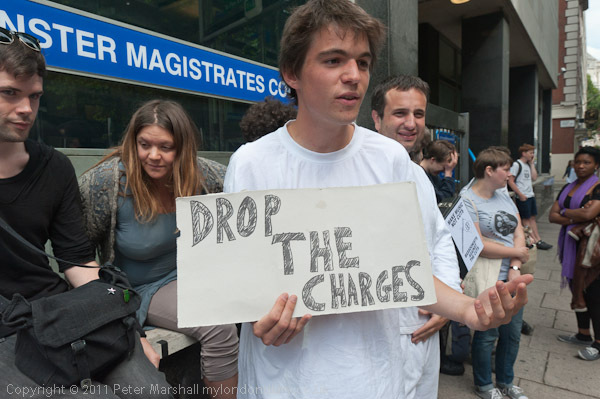 Although the majority of the 145 UK Uncut ptotesters who were arrested on leaving their peaceful occupation of Fortnum & Mason on March 26 have had the charges against them dropped as not being in the public interest, the Crown Prosecution Service is continuing to press charges of aggravated trespass against around 30 of them. 17 of these were in Westminster Magistrates Court and all pleaded not guilty to the offence. The CPS is apparently continuing to press charges against these people on the grounds that they possessed leafets and banners, and that this indicated that they had an intention to promote their cause. Even the judge seemed to find this odd, stating that it was entirely legitimate for protesters to promote their cause. During the occupation, the police praised the protesters for their cooperation with the police in not attempting to leave the premises. Chief inspector Claire Clark, the senior officer present can be seen and heard on a video on YouTube promising them that they would be free to leave, but apparently knew at the time that the police were planning to arrest them as they left. They appear to have been held in the store until things had calmed down outside and the police were ready to make the arrests. Although things in the store were peaceful, outside areas of pitched battle between police and protesters had been taking place sporadically across central London for several hours. Considerable damage was caused to shops by breaking windows and throwing paint. (Had I not been hit by a paintball earlier I would have almost certainly have been photographing both in the store and outside.) Very few of these more violent protesters were arrested and even fewer have been charged with any offences. It seems clear that police and CPS have decided to act deliberately against the almost entirely peaceful UK Uncut protesters, almost certainly because of the success they have had in gaining public support for their campaign against tax dodgers. It is hard not to see these cases as a deliberate attack on our rights to peaceful protest. Quite a few of those who had come to show support for the UK Uncut protesters went in to the public gallery to hear the proceedings, while a group of around 30 protested on the pavement outside. One woman was wearing a translucent plastic suit over her underwear and on her back was a sign 'would you send your daughter home like this?' as apparently this was the state in which some of those arrested were turned out of police stations, mainly many miles from where they lived and left to find their way home. She told me that she had been detained for 17 hours before being released. Others carried posters or placards calling for the charges to be dropped. It is still hard to beleive, given the video and other evidence, that these cases will actually come to trial or that convictions could be obtained in what seem so clearly politically motivated prosecutions. Cancer care charity Maggie's big London fund-raiser has been hard hit by the riots. Their Hug London protest today was to urge people to register for their charity Night Hike in London next month. 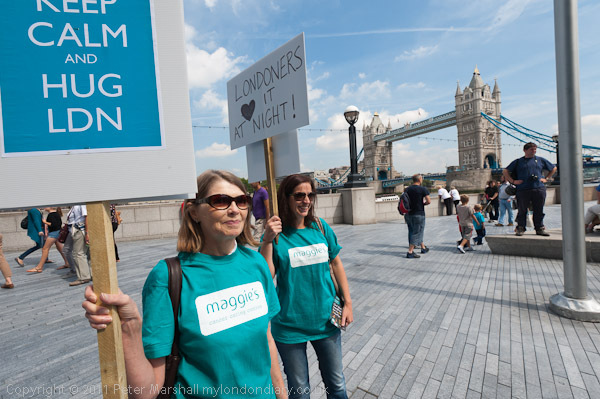 A small but dedicated group of supporters of Maggie's Centres demonstrated at City Hall in London today before marching along the riverside offering free hugs to passers by. Maggie's centres offer support for anyone affected by cancer and to their family and friends from the time of diagnosis, during and after treatment, to recurrence, end of life or in bereavement. Begun by Maggie Jencks after the recurrence of her breast cancer in 1993 and set up as a charity with the help of others, the first Maggie's centre opened in Edinburgh shortly after Maggie's death in 1995. There are now five centres in Scotland and two in England including one in London, with interim services at four other locations and online and others being actively worked on. Maggie's major London fund raising event is a London Night Hike, a a 10 or 20 mile adventure held in partnership with OpenHouse London, with hikers getting to visit inside a number of iconic buildings on the route for food and entertainment. Hikers pay a fee of £30, with discounts for groups of four or more. As well has having a fun and unusual night out, they also support a very worthwhile cause. This years London Night Hike takes place on Friday 16 September, and the start of registration took place at the same time as there were riots in London. Although London will almost certainly be back to its normal peaceful self next month when the hike happens, the registrations were severely hit. The Maggie's Centre protest started close to City Hall, with most of those taking part wearing distinctive green Maggie's Centre's t-shirts. They carried placards 'Keep Calm and Hug LDN' and others offering free hugs and messages such as 'Tea & Hugs', 'Come Alive At Night' and 'Londoners Love It At Night'. After marching to City Hall they held their placards in front of it, then turned towards it to hug the building. From there the group made its way along the riverside walk towards the South Bank, handing out invitations to take part in the London Night Hike and offering hugs. As a community response to the riots which began there and the despair and frustrations that underlie them, 1500 people marched from Dalston to Tottenham pleading "Give Our Kids a Future." Many of those who live in the more deprived areas of our cities or who work on the streets of them were not surprised by the disorder and looting that began in Tottenham last Saturday and quickly spread to other areas. It had for some time - certainly since the election of the coalition and the start of their programme of cuts - seemed inevitable and was clearly predicted by some. There was a riot waiting to happen and it just needed a spark to set it off. The cuts had begun under the previous government - and Labour had pledged to continue them were they re-elected, though perhaps with not quite the same conviction and apparent relish as the coalition. Already the youth services have been hard hit, and many youth clubs and other facilities have been closed. The announcement that the Educational Maintenance Allowance (EMA) was to end this summer had much of the youth of London up in arms around the end of last year, with school kids taking part in the student demonstrations, as well as protesting against university fee hikes. Many saw and suffered from heavy-handed policing with kettling, excessive use of batons and charges into crowds by police horses. The frustration and anger felt my many in poorer areas against the police continues to be ratcheted up by the stopping and searching targeted disproportionately on ethnic minorities and young people, particularly young men. It has been exacerbated by the many unexplained deaths in police custody as well as a few on the streets, and anger and resentment have been greatly multiplied by the lies told by police to the press, and the various cover-ups and white-washing by the IPCC, CPS and other authorities that have been used to prevent bringing those responsible to justice. It wasn't even the shooting of Mark Duggan in what many in the area feel to have been a police execution, though others suspect it may have been more a matter of an officer cracking under pressure than any deliberate act. Though the undisguised glee with which some of the right wing media greeted his death (having tried and convicted him as a drug dealer) clearly raised tempers. Even the total failure by Tottenham police to engage with the family members and others who held a peaceful vigil last Saturday might have passed without incident. What triggered the outbreak of rage that swept areas of London and other cities was when a group of police decided that a 15 year old girl was being too mouthy and attacked and beat her with their batons as outraged onlookers shouted their protests. 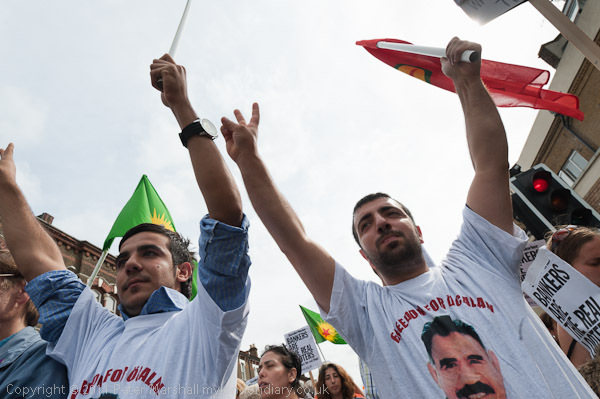 The march was organised and supported by a wide range of locally based organisations, including the Haringey Alliance for Public Services and the Hackney Alliance to Defend Public Services, Day-mer, the Turkish and Kurdish Community Centre, Day-Mer Youth, the North London Community Centre, the Alevi Cultural Centre, Fed-Bir, the Kurdish Community Centre, Roj Women, Halkevi, Gik-Der (the Refugee Workers Cultural Association), Britania Peace Council, the TOHUM Cultural Centre in Stoke Newington as well as various wider political and other groups including the Socialist Party, Youth Fight for Jobs, Right to Work and Red Pepper magazine. While the organisers did not want to condone any illegal behaviour they set out to bring all sections of local communities together to promote unity and to urge for positive action working together to find solutions to some of the long-standing problems of the area which made it fertile ground for the disturbances. Most of the demands made by the marchers and echoed in the various slogans they chanted were related to services in their community which have already been cut or are under threat. They want an end to the cuts in public services and for investment to be made into regeneration of the communities, with housing, jobs, education and leisure facilities and a restoration of all the youth services that have been cut. More specifically about the riots they want a community led regeneration of the damaged areas and support for those affected, including the immediate rehousing of those made homeless and grants for small businesses. "Let's work together for a decent society, based not on greed, inequality and poor conditions, but on justice, freedom, sharing and cooperation." The march made its way slowly up through Dalston and Stoke Newington, past Stamford Hill, where a number of small groups of orthodox Jews stood watching, and on past Seven Sisters to the council offices at Tottenham Green, where everyone stopped for a rally with anyone who wished to speak being given 2 minutes to say what they wanted. Shortly before the march reached Seven Sisters there was one slightly odd incident, where a man who had been laying flowers on the road in front of the procession which the children had picked up was taken to one side by police and questioned briefly. He agreed to let them search his backpack, and after they did so they let him continue to follow the march. Hiroshima Day, the 66th anniversary of the bomb that devastated the city and began the nuclear age was marked around the world. 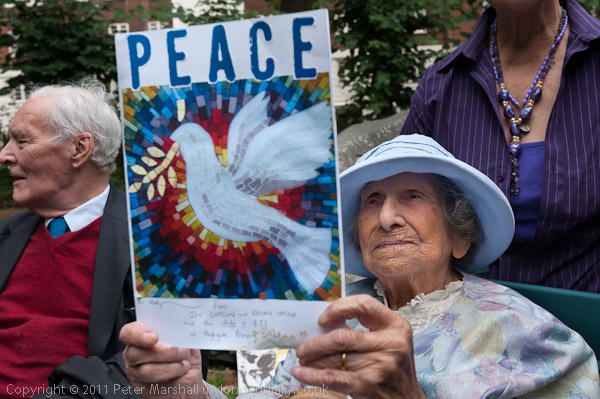 Hetty Bower,105, spoke at the London event, calling for world peace and an end to nuclear weapons. Sixty-six years ago the world entered the nuclear age as a single bomb exploded and shattered the small Japanese city of Hiroshima. Ceremonies around the world today remembered this and called for world peace and an end to nuclear weapons. The bomb above Hiroshima on 6 August 1945 was followed three days later by another at Nagasaki, again with a huge death toll, both immediately and in the years afterwards as the world for the first time saw the results of nuclear radiation and fallout. It was also the start of another era, as Tony Benn, speaking in Tavistock Square today reminded us. Although dropped on Japan, a nation already on the brink of surrender, it was aimed at the USSR, a powerful reminder that despite the size and might of the Red Army, the USA still held the upper hand. The event, organised by London Region CND, started with the choir 'Raised Voices' singing in 'The Hiroshima Song' written by a survivor of the bomb. Its English translation was given as "Let's tell our children about love, wisdom to survive, and what happened in Hiroshima and Nagasaki on those very days." The choir sang several further songs later in the event, finishing it off leading the crowd of more than a hundred people in the well known 'Don't you hear the H-bomb's thunder ..."
Tenor Anthony Flaum needed no microphone to fill the square with his voice as he performed 'Peace Just Wanted to be Free' and 'Peace Will Rain', and the 'Purple Poets' performed four poems from the Quaker Library, written by poets who had fought and gone to prison for their opposition to war. Hetty Bower started her anti-war campaign in 1914 when she was almost nine. She got an extra holiday from school when the premises were used as a recruiting centre, but at she said "it didn't take this young schoolgirl very long for the reality of war to become evident. This child saw men with one trouser leg rolled up because there was no human leg to go in it..." She held up a photograph of her great grandchild, one year old on Tuesday (Nagasaki Day) and said that she wanted "him to grow up and live in a world of peace." It was a remarkably powerful performance for a 105 year old who still takes part in every major anti-war march. Other speakers included the present Mayor of Camden, where in 1967 then mayor Millie Miller planted a cherry tree in Tavistock Square "in memory of the victims, past and present, of the atomic bombs dropped on the Japanese cities of Hiroshima and Nagasaki", and the ceremony took place in the area beside that tree, now grown to a large size. Bruce Kent reminded us of that talking about disarmament is now respectable - although many politicians feel it should only apply to other countries, but that now their are undeniable financial arguments against the waste of money on armaments and in particular of the ridiculous decision to spend huge amounts on a replacement for Trident. Even many in the military are opposed to this, both because it will be under US control, but also because it has no military use. Rev Nagase, a Japanese monk from the Battersea Peace Pagoda talked about a peace pilgrimage he is making and the example of the Roman soldier St George as a martyr, and of his respect for the late Brian Haw before ending his speech with a short prayer. Tony Benn reminded us that 66 years ago also saw the founding of the United Nations and that it's charter called for the nations to live at peace. After his speech there was a minutes silence and people brought flowers to lay around the Hiroshima cherry tree, before the final song. Afterwards everyone was invited to stay and picnic in the square but I had to leave.